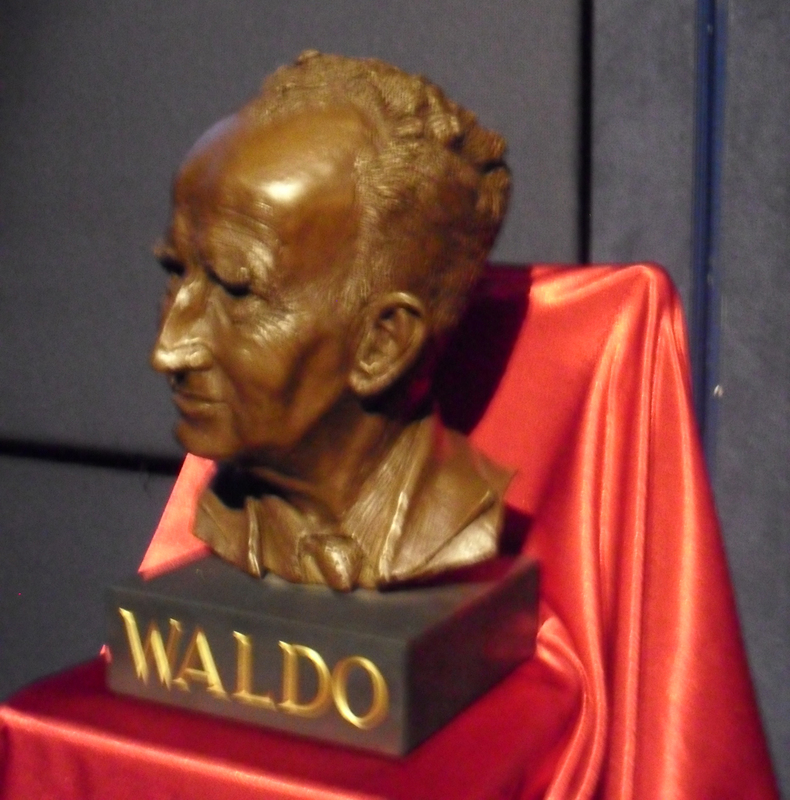 The Annual Waldo Williams Lecture is by now a literary event of merit. 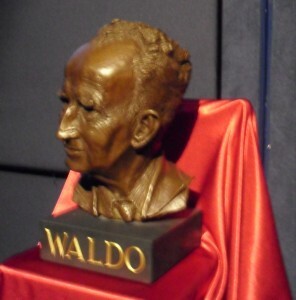 The Waldo Williams Society was only formed five years ago. The committee meetings are held in Mynachlog-ddu, Pembrokeshire. But it is truly a national organisation attracting the best of our lecturers. 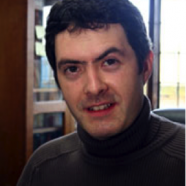 This year was no exception as Professor Jason Walford Davies threw light anew on the poet who encountered the Welsh language during the four years of his childhood spent in the village at the foothills of the Preselau. In order to emphasize the national aspect the lecture was held at Y Drwm in the National Library, Aberystwyth on Friday evening, September 25. 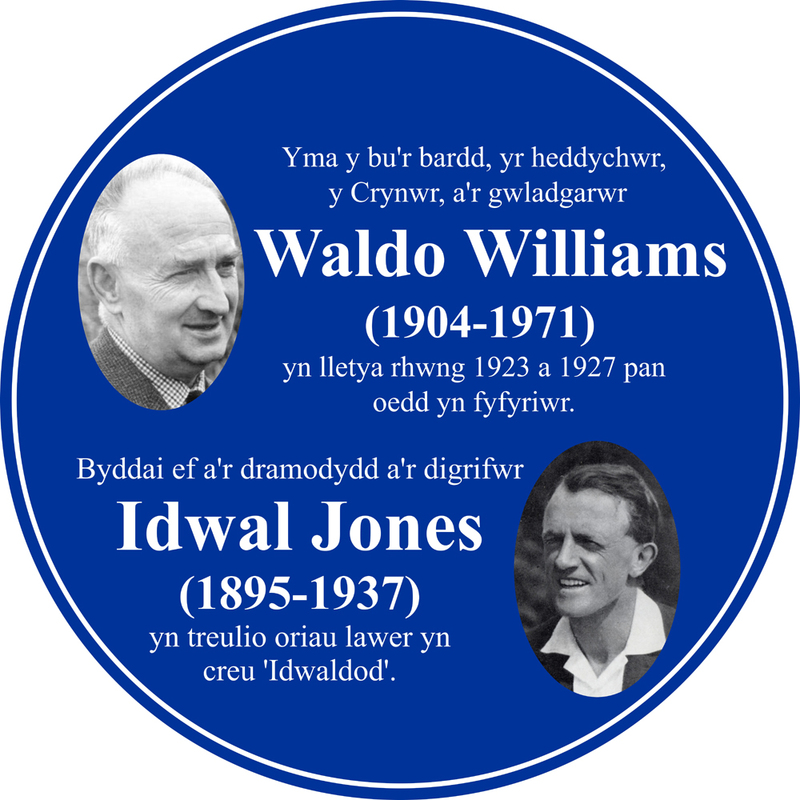 This was appropriate as much of the correspondence to do with Waldo, particularly his letters to his great friend, D. J. Williams, Fishguard, are kept at the Library. D. J’s diaries also throw light on their sometimes fraught relationship. The cross-section represented within the audience, from farmers to politicians, reflected the wide interest by now nurtured in the life and work of the poet, pacifist, Quaker and patriot. The academic from Bangor University based his trenchant comments on the relationship between Waldo Williams and Megan Humphreys, a teacher from the village of Llanberis, at the foot of Snowdon, as manifested in the vast correspondence between them in the 1930’s and again in the 1960’s. Miss Humphreys kept all the letters received from Waldo. She treasured them. The letters, which span over 20,000 words in total, remain in private hands. But her letters to Waldo are not available. Waldo listening to the lecture! The photographs shown on the screen were a bonus. One of them was of her and her hero in the bloom of youth. He in a short trouser. They must have met somewhere to spark the correspondence. What they had in common was the fact they were both teachers. Megan had taught in Nottingham for 16 years before her appointment to the staff of Ysgol Dolbadarn. Waldo, on the other hand, was dependent on irregular employment in schools all over Pembrokeshire. But he had already begun to make a name for himself as a poet and author with his various contributions to a magazine entitled ‘Y Ford Gron’. He laid bare his heart to Megan, who was obviously of a similar temperament, as he often mentioned his frustration at not being able to stay in any one school long enough to form a meaningful relationship with the pupils. He was moved from Ysgol Llanerchllwydog in the Gwaun Valley to the coastal village of Dale in the south of the county. He mentioned how he yearned for the company of the Welsh speaking pupils and how he dreamt he had on one lunch hour ran all the way, over 25 miles, up to see them! He also insisted that nothing happened in Dale apart from sun, rain and wind. On another occasion he mentioned he was as ‘weak as smoke’ and that the ‘loneliness of a town was far more lonely than the loneliness of the country’. As well as the sombre comments, as expected from Waldo, there were plenty of light-hearted comments as well as a play on words. Jason Walford hardly referred to the contents of the 1960’s correspondence other than suggesting the wealth of information that awaits us which will throw further light on Waldo’s thought processes. In fact the lecture itself entitled ‘From Gracie Fields to “In Two Fields”’ was merely a tantalising tease as there is a volume in preparation reflecting on the contents of the letters, as well as a clutch of photographs, that will hopefully be published next year. It is only then that the true meaning of the lecture title will be made known. However, the voice of the popular entertainer of the 1930’s was heard at Y Drwm. 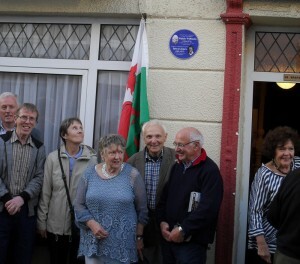 Prior to the lecture a plaque was unveiled on the wall of 58, Cambrian Street, Aberystwyth, by Emyr Llewelyn to denote the fact that Waldo, in his student days, and the dramatist and comedian from Lampeter, Idwal Jones, shared lodgings there. It was where they composed what has become known as ‘Idwaldod’ – light-hearted literature full of nonsense and the ridiculous. 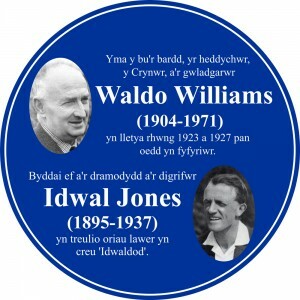 In his address Emyr explained how both surmounted their particular ailments – Idwal’s tuberculosis and Waldo’s nervous disposition – by creating such hilarity. Humour was used as a means of healing and thus creating a lodging house of mirth. Both events were presided by the Rev Eirian Wyn Lewis, Cymdeithas Waldo chairman. 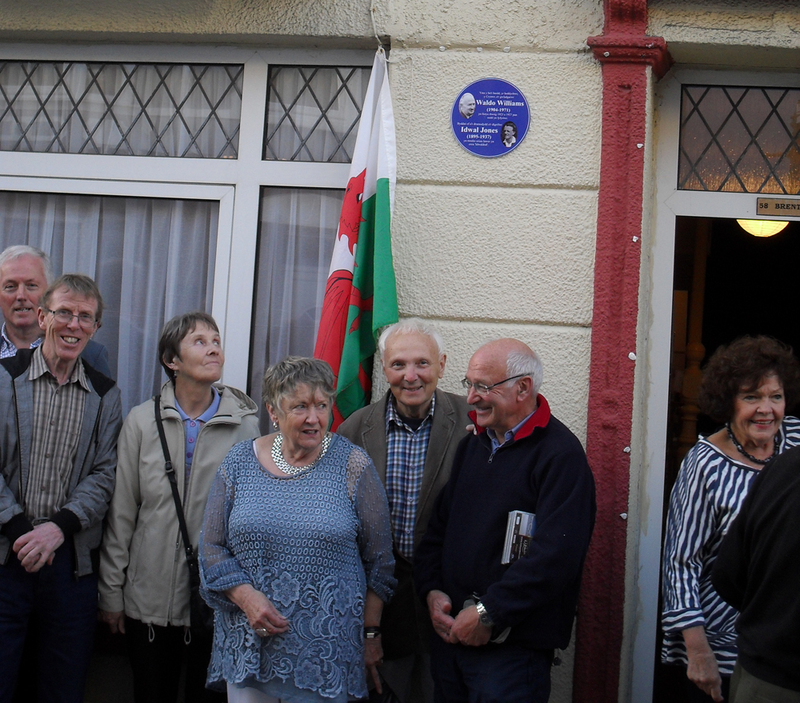 Thanks must be given to Richard and Ederlinda Evans, the proprietors of 58, Cambrian Street, for their co-operation, their welcome and their enthusiasm.